I have included a chapter from a book from the Victoria age where the author claims to have met aquatic natives in New Guinea. Unfortunately I haven’t found any collaborating evidence for this, so we can only take the author's word for this. This is why I have put this chapter in the appendix. CHAPTER 11. Our Discovery of Flat-Footed Lake Dwellers. Many were the wild and fantastic rumours we had heard at the Residency at Cape Nelson, on the north-east coast of British New Guinea, concerning a curious tribe of natives whose feet were reported to be webbed like those of a duck, and who lived in a swamp a short way in the interior, some distance to the north of us. I myself had at first been inclined to sneer at these reports, but Monckton, the Resident Magistrate, with his superior knowledge of the Papuans, as the natives of New Guinea are called, was sure that there was some truth in the reports, as the Papuan who has not come much in contact with the white man is singularly truthful though guilty of exaggeration. I knew this, but I had in mind the case of the Doriri tribe, who lived in the interior a little to the south of us. These Doriri (who had had the kindly forethought to send us word that they were coming down to pay us a visit to eat us, for the Papuan, though a savage, is often most suave and courteous and by no means lacking in humour), were reported to us as having many tails, but needless to say when we made some prisoners, we were scarcely disappointed to find that the said tails protruded from the back of the head (in much the same fashion as the Chinaman's pigtail); in this case each man had many tails, which were fashioned by rolling layers of bark from a certain tree - closely allied, I believe to the "paper tree" of Australia - round long strands of hair. As we three, with our twenty-five native police and four servant boys, rowed up the Barigi River in our large government whaleboat, on our way to search for these "duck-footed" people, I could not help being struck with the very great beauty of the scene. Giant trees laden with their burden of orchids, parasites and dangling lianas, surrounded us on both sides, their wide-spreading branches forming a leafy arcade far over our heads, while palms in infinite variety, intermixed with all sorts of tropical forms of vegetation, and rare ferns, grew thickly on the banks. Some distance behind us came our large fleet of canoes, bearing our bags of rice and over one hundred carriers, and as they paddled down the dark green oily waters of this natural arcade, with much shouting and the splashing of many paddles, it made a scene which is with me yet and is never to be forgotten. As we proceeded, the river got more narrow, and fallen trees from time to time obstructed our way. We at length landed at a spot where we were met by a large number of the Baruga tribe, who brought us several live pigs tied to poles, and great quantities of sago, plantains and yams. They had expected us, as we had camped in their country the previous night. They had been "licked" into friendliness by Monckton, who less than a year ago (as elsewhere mentioned) had sunk their canoes, and together with the aid of the crocodiles, which swarm in this river, had annihilated a large force of them. And now to show their friendliness they were prepared to do us a good turn, by helping us to find these duck-footed people, with whom (they told us) they were well acquainted. Oyogoba, the chief of the Baruga tribe, came to meet us. He assured us of the friendliness of his people, and himself offered to accompany us. His arm had been broken in the encounter with Monckton and his police, and Monckton had immediately afterwards set it himself. It now seemed quite sound. We soon resumed our journey, on foot, passing through very varied country, plains covered with tall grass and bounded by forest, through which at times we passed. At other times we had to force our way through thick swamps in which the sago-palm abounded, from the trunks of which the natives extract sago in great quantities. About mid-day we arrived at a fair-sized village belonging to the Baruga tribe. It was surrounded by a tall stockade of poles, and as we entered it, the women sitting in their huts greeted us with their incessant cries of "orakaiba, orakaiba" (peace). On this account the natives of this part of New Guinea are generally termed "Orakaibas" by other tribes. The houses here seemed larger and better built than most Papuan houses that I had hitherto seen, and there were many curious tree-houses high up among the branches of some very large, trees in the village, some being fully eighty feet from the ground. They had broad ladders reaching up to them, and looked very curious and picturesque. These ladders are made of long rattans from various climbing palms. These rattans, of which there were three double strings, are twisted in such a way as to support the pieces of wood which form the steps. In one case a ladder led from the ground in the usual way to a house built in a small tree about thirty feet from the ground, but a second ladder connected this house with another one in a much larger tree about eighty feet off the ground. I climbed the first ladder, but the second one swayed too much. These tree-houses axe built partly as look-out houses, from which the approach of the enemy is discovered, and partly as vantage points from which the natives hurl down spears at their opponents below when attacked. Resuming our journey, after a brief halt in this village, we soon came to the Barigi River again, which we crossed, camping in a small deserted village close by. Here I noticed several more tree-houses in the larger trees. This had been a very hot day, even for New Guinea, and I could not resist taking a most refreshing bathe in the river, though I must confess I was glad to get out again, having rather a dread of the crocodiles, which infest parts of this river, though they were not nearly so numerous up here as in the lower reaches of the river which we had traversed in the morning. We were up the following morning before sunrise, and were all much excited at the prospect before us of discovering this curious tribe. This day would show whether or no our journey was to prove fruitless. Soon after leaving the village we entered a dense forest, the growth of which was wonderfully beautiful. Tall PANDANUS trees, some of them supported by a hundred and more long stilted roots, which rose many feet above our heads, reared their crowns of ribbon-like leaves above even some of the giants of the forest. Palms of all shapes and sizes, dwarfed, tall, slender and thick, surrounded us on every side, and at least three different species of climbing palms scrambled over the tallest trees. The tree trunks were hidden by climbing ferns and by a white variegated fleshy-leafed POTHOS. Orchids, though not numerous, were by no means scarce on the branches of some of the larger trees, and were intermixed with many curious and beautiful ferns. There were many large-leafed tropical plants somewhat resembling the HELICONIAS and MARANTAS of tropical America. Flowers were not very plentiful, but here and there the forest would be literally ablaze with what is said to be the most showy flowering creeper in the world, huge bunches of large flowers of so vivid a scarlet that Monckton and I agreed no painting could do them justice. It is sometimes known as the DALBERTIA, but its botanical name is MUCUNA BENNETTI. It has been found impossible to introduce it into cultivation. Among other flowers were some very large sweet-scented CRINUM lilies and some very pretty pink flowering BEGONIAS, with their leaves beautifully mottled with silver. Here and there we would notice a variegated CROTON or pink-leafed DRACAENA, but these were uncommon. As we proceeded, I noticed that in spite of the very dry weather we had been having, the ground each moment became more moist, which indicated that we were approaching the swamps we had heard about. It was a rough track over fallen trees and dry streams, but before long we passed along the banks of a creek full of stagnant water. We at length left the forest and found ourselves in open country, covered with reeds and rank grass, through which we slowly wended our way. Suddenly, however, we halted, and looking through the tall grass, saw some of the houses of the Agai Ambu tribe close at hand. Down we all crouched, hiding ourselves among the grass, while two of our Baruga guides, who speak the language of the Agai Ambu, went forward to try and parley with them and induce them to be friendly with us. We soon heard them yelling out to the Agai Ambu, who yelled back in reply. This went on for some minutes, when the Baruga men called out to us to come on. Jumping up, we rushed forward through the grass and witnessed a remarkable scene. In front of us was a lake thickly covered with water-lilies, most of them long-stemmed and of a very beautiful blue, with a yellow centre, and with large leaves, the edges of which were covered with a kind of thorn; there were also some white ones with yellow centre. On the other side of the lake were several curious houses built on long poles in the water, the houses themselves being a good height above the water. The lake presented a scene of great confusion. The inhabitants were fleeing away from us in their curious canoes, which, unlike most Papuan canoes, had no outrigger whatever. Their paddles also were peculiar, the blades being very broad. Close to us were our two Baruga guides in a canoe with one of the Agai Ambu tribe, who directly he saw us plunged into the lake and disappeared under the tangled masses of water lilies. He remained under some time, but on his coming to the surface again, one of the Baruga men plunged in after him, and we witnessed an exciting wrestling match in the water. The Baruga man was by far the more powerful of the two, but he was no match for the almost amphibious Agai Ambu, who slipped away from his grasp like an eel, and swam away, with the Baruga man in close pursuit. All this time a canoe full of the Agai Ambu was rapidly approaching to the rescue, waving their paddles over their heads, and the Baruga man, seeing this, climbed back into his canoe and paddled back to us. Meanwhile the police had made a rush for a canoe which was close at hand; but it at once upset, having no outrigger and being exceedingly light and thin; it was, in fact, a species of canoe quite new to our police. In any case they would not have had the slightest chance of overtaking the fleet Agai Ambu in their own canoes. It looked very much as if after all we were not to have the chance of verifying the strange reports about the formation of these people. As a last resource we sent over our two Baruga guides in a canoe to speak with those of the tribe who had not fled. As the guides approached they shouted out that we were friends, and that as we were friends of the Baruga tribe, we must be friends of the Agai Ambu tribe as well. We held up various tempting trade goods, including a calico known as Turkey-red, bottles of beads, etc. This and a long conversation with the Baruga men seemed to carry some weight with them, for the Baruga soon returned with one of their number, who turned round in the canoe with his arms outstretched to his friends and cried or rather chanted, in a sobbing voice, what sounded like a very weird song, which seemed quite in keeping with the mournful surroundings and lonely life of these people. This weird song, heard under such circumstances, quite thrilled me, and wild and savage though the singer was, the song appealed to me more than any other song has ever done. It looked as if he might be ane'er-do-weel or an idiot whom his friends could afford to experiment with before taking the risk of coming over themselves, but his song was no doubt a farewell to his friends, whom he possibly never expected to see again. He certainly looked horribly frightened as he stepped out of the canoe. We at once saw that there was some truth in the reports about the physical formation of these people, although there had been exaggeration in the descriptions of their feet as "webbed." There was, between the toes, an epidermal growth more distinct than in the case of other peoples, though not so conspicuous as to permit of the epithet "half-webbed," much less "webbed," being applied to them. The most noticeable difference was that their legs below the knee were distinctly shorter than those of the ordinary Papuan, and that their feet seemed much broader and shorter and very flat, so that altogether they presented a most extraordinary appearance. The Agai Ambu hardly ever walk on dry land, and their feet bleed if they attempt to do so. They appeared to be slightly bowlegged and walk with a mincing gait, lifting their feet straight up, as if they were pulling them out of the mud. Sir Francis Winter, the acting Governor of British New Guinea, was so interested in our discovery, that he himself made another expedition with Monckton to see these people, while I was still in New Guinea. On his return I stayed with him for some time at Government House, Port Moresby, and he gave me a copy of his report on the Agai Ambu, which explains the curious physical formation of these people better than I could do. He says: "On the other side of this mere, and close to a bed of reeds and flags, was a little village of the small Ahgai-ambo tribe, and about three-quarters of a mile off was a second village. After much shouting our Baruga followers induced two men and a woman to come across to us from the nearest village. Each came in a small canoe, which, standing up, they propelled with a long pole. One man and the woman ventured on shore to where we were standing.” The Ahgai-ambo have for a period that extends beyond native traditions lived in this swamp. At one time they were fairly numerous, but a few years ago some epidemic reduced them to about forty. They never leave their morass, and the Baruga assured us that they are not able to walk properly on hard ground, and that their feet soon bleed if they try to do so. The man that came on shore was for a native middle-aged. He would have been a fair-sized native, had his body from the hips downward been proportionate to the upper part of his frame. He had a good chest and, for a native, a thick neck; and his arms matched his trunk. His buttocks and thighs were disproportionately small, and his legs still more so. His feet were short and broad, and very thin and flat, with, for a native, weak-looking toes. This last feature was still more noticeable in the woman, whose toes were long and slight and stood out rigidly from the foot as though they possessed no joints. The feet of both the man and the woman seemed to rest on the ground something as wooden feet would do. The skin above the knees of the man was in loose folds, and the sinews and muscles around the knee were not well developed. The muscles of the shin were much better developed than those of the calf. In the ordinary native the skin on the loins is smooth and tight, and the anatomy of the body is clearly discernible; but the Ahgai-ambo man had several folds of thick skin or muscle across the loins, which concealed the outline of his frame. On placing one of our natives, of the same height, alongside the marsh man, we noticed that our native was about three inches higher at the hips. "I had a good view of our visitor, while he was standing sideways towards me, and in figure and carriage he looked to me more ape-like than any human being that I have seen. The woman, who was of middle age, was much more slightly formed than the man, but her legs were short and slender in proportion to her figure, which from the waist to the knees was clothed in a wrapper of native cloth. "The houses of the near village were built on piles, at a height of about twelve feet from the surface of the water, but one house at the far village must have been three or four feet more elevated. Their canoes, which are small, long, and narrow, and have no outrigger, axe hollowed out to a mere shell to give them buoyancy. Although the open water was several feet deep, it was so full of aquatic plants that a craft of any width, or drawing more than a few inches, would make but slow progress through it. Needless to say that these craft, which retain the round form of the log, are exceedingly unstable, but their owners stand up in them and, pole them along without any difficulty. "These people are very expert swimmers, and can glide through beds of reeds or rushes, or over masses of floating vegetable matter, with ease. They live on wild fowl, fish, sago and marsh plants, and on vegetables procured from the Baruga in exchange for fish and sago. They keep a few pigs on platforms built underneath or alongside their houses. Their dead they place on small platforms among the reeds, and cover the corpse over with a roof of rude matting. Their dialect is almost the same as that of the Baruga. Probably their ancestors at one time lived close to the swamp, and in order to escape from their enemies were driven to seek a permanent refuge in it." Thus it will be seen that Sir Francis was much impressed with these people, and he heartily congratulated me upon our discovery. To resume my personal account. We soon gave the man confidence by presenting him with an axe, some calico and beads, and a small looking-glass, which was held in front of him. He gazed in stupefied wonderment at his own features so plainly depicted before him. He was taken back to the other side, and soon returned with two more of his tribe, who brought us a live pig, which they hauled out from a raised flooring beneath one of their houses. The country all round us seemed to be one large swamp, and we stood upon a springy foundation of reeds and mud; except for these, we should undoubtedly have soon sunk out of sight in the mud. As it was, we stood in a foot of water most of the time, and in places we had to wade through mud over our knees. The lake swarmed with many kinds of curious water-birds, the most common being a red-headed kind of plover; there was also a great variety of duck and teal. The swamps were full of large spiders, which crawled all over us; we had to keep continually brushing them off. Farther down the lake we saw another small village, and we were told that these two villages comprised the whole of this curious tribe. Whether they axe the remnants of a once powerful tribe it is impossible to say, but their position is well-nigh impregnable in case they are ever attacked, as their houses are surrounded by swamps and water on all sides, and no outsider could very well get through the swamps to their villages. The only possible way to get there would be to cross the water in their shell-like canoes, a feat which no man of any other tribe would ever be able to manage. Monckton thought that these swamps and lake were formed by an overflow of the Musa River. This had been a phenomenally dry season for New Guinea, so these swamps in an ordinary wet season must be under water to the depth of many feet. We camped close by on the borders of the forest amid a jungle of rank luxuriant vegetation, over which hovered large and brilliant butterflies, among them a very large metallic green and black species (ORNITHOPTERA PRIAMUS) and a large one of a bright blue (PAPILIO ULYSES). The same afternoon we three went out shooting on the lake. Two of the Agai Ambu canoes were lashed together and a raft of split bamboo put across them, and two Agai Ambu men punted and paddled us about. Before starting we had first educated them up to the report of our guns, and after a few shots they soon got over their fright. The lake positively swarmed with water-fowl, including several varieties of duck, also shag, divers, pigmy geese, small teal, grebe, red-headed plover, spur-wing plover, curlew, sandpipers, snipe, swamp hen, water-rail, and many other birds. The red-headed plover were especially numerous, and ran about on the surface of the lake, which was covered with the water-lily leaves and a thick sort of mossy weed. All the birds seemed remarkably tame, and we got a good assorted bag, chiefly duck - enough to supply most of our large force with. I stopped most of the time on the raised platform of one of the houses and shot the duck, which Acland and Monckton put up, as they flew over my head. I had a companion in old Giwi, the chief of the Kaili-kailis, many of whom were among our carriers. He seemed to be on very friendly terms with one of the Agai Ambu on whose hut I was. Presently a woman came over in a canoe from one of the houses in the far village, and climbed up on to the platform where we were. Directly she saw old Giwi, she caught hold of him and hugged and kissed him all over and rubbed her face against his body, covering him with the black pigment with which she had smeared her face. She was sobbing all the time and chanting a very mournful but not unmusical kind of song. This exhibition lasted over half an hour, and poor old Giwi looked quite bewildered, and gazed up at me in a most piteous way, as much as to say: "Awful nuisance, this woman - but what am I to do?" He understood the meaning of this performance as little as I did. Possibly the woman was frightened of us, and seeing a stranger of her own colour in old Giwi, appealed to him for protection. The Baruga, however, had previously told us that the Agai Ambu had recently captured one of their women, and I have since thought that this might possibly have been the woman, and am sorry I did not make inquiries at the time. At all events, old Giwi was too courteous to shake her off, though to me it was a most amusing sight, and it was all I could do to refrain from laughing aloud. We saw the dead body of a man half-wrapped in mats tied to poles in the middle of the lake. They always dispose of their dead thus, and I suppose leave them there till they rot or dry up. The chief food of these people seemed to be the bulbs of the water-lilies, fish and shellfish. They catch plenty of water-fowl by diving under them and pulling them under the water by the legs before they have time to make any noise. By this method they do not frighten the rest away, and this accounts for the birds' extreme tameness. It seemed odd that we should be paddled about the lake, to shoot wild fowl, by these people, who until to-day had never seen a white man before and had fled from us in the morning. However, most of them had fled and would not return until we had left their country. There is little doubt that this part of the country is most unhealthy. Many of our police and carriers were two days later down with fever, and a few weeks later I had a bad attack of fever, with which I was laid up in Samarai for some time, and which I feel sure I got into my system in this swamp. The mosquitoes were certainly very plentiful and vicious. We spent the following day here, duck-shooting on the lake, and I did a little natural-history collecting in the adjacent forest. We had intended to try and induce two of the Agai Ambu to accompany us back to Cape Nelson, but most unfortunately they understood that we were going to take them forcibly away. They became alarmed and all disappeared, and we were not able to get into communication with the magain. When Sir Francis Winter visited them about a month later they were evidently quite friendly again, but on the second day of his visit his native followers demanded a pig of the Agai Ambu in his, Sir Francis’s, name. At this they became alarmed and retreated to the further village, and he was unable to see anymore of them. Since then I believe nothing more has been seen of these flat-footed people. After I published my book on the Internet some people have written to me to say that if we accept the Aquatic Ape Theory then perhaps some Aquatic humans split off from the main human group and continue to evolve into a fully aquatic animal. And this fully aquatic human is the origins of the mermaid myth. I have to admit I have had considered this myself. 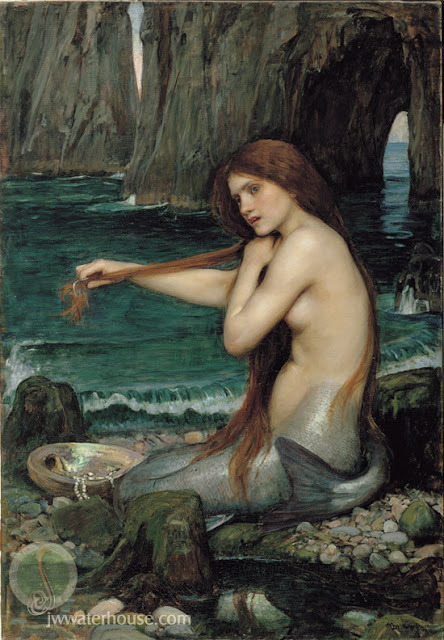 And I have to admit in researching mermaid myths, there are many sightings where people have claimed to have seen a woman with a tail of a fish. But in the end I have rejected this idea simply because the evidence of a fully aquatic human is so weak while there is far more evidence to support the idea that mermaids are simply woman divers. Also it is doubtful in the time available that humans could evolve into a fully aquatic creature. Yet I am not going to reject this idea completely, simply because it is a nice idea. So I would like to put forward the reasons why it might be possible, without taking it too seriously. Clearly it is very unlikely a human can evolve to have a fish tail, simply because a human is a mammal and not a fish. But a dolphin is a mammal, so could a human evolve to have a tail like a dolphin? Again no, human beings do not have tails, dolphins evolved from a semi-aquatic animal similar to the beaver or platypus both of which have large flat tails that use them to propel themselves through the water. Over evolutionary time these tails changed to become more efficient until they look like fish tails. So if we want to look to what a fully aquatic human would look like, we have to look at the seal. A seal like a human doesn’t have a tail, and so it uses its hind legs to propel itself through the water. With its hind legs evolving to now look something like the feet of a water-bird with webbing between its toes. The seal then can move its body side to side to propel itself along like a fish. It is an open secret that Olympic champion swimmers like Mark Spitz, Michael Phelps and Ian Thorpe, have either large hands or feet to help propel themselves through the water. So an aquatic human would likewise evolve very large feet and perhaps webbed toes and end up having feet that look like flippers. Which would be a great help in the water but a handicap on land, as anyone will know who have attempted to walk on land with flippers on their feet. It is doubtful if an aquatic human would evolve very large hands, simply because large hands are a help in swimming on the surface of the water but can create a lot of drag when swimming underwater. Also an aquatic human will survive by using their hands to pick shellfish of the bottom of the sea, and so will not be using them all the time for forward propulsion. This means, if a fully aquatic human did evolve the only difference it would have from ordinary humans it that it has large flipper like feet. Which would be a big advantage in the water but a handicap out of the water. In spite of this such a human being my still look like a traditional mermaid. As previously pointed out in many mermaid reports of the past the mermaid has two tails which will be the mermaids legs. Also in the sport of swimming there is a difference of opinion whether it is quicker to swim using a butterfly kick, that is keeping your feet together, or kicking your legs alternatively like in overarm swimming. So it could be that some aquatic humans did keep their legs together while swimming and this would look like a fish tail. So if a branch of humans evolved like this they clearly don’t exist today. There has been very few reports of mermaids in the 20th century, and these reports are doubtful. If an aquatic human still exists it would have to be fully aquatic, as it would have to be independent of land. Simply because there are very few beaches in the world today where there are not people, so any fully aquatic human coming onto a beach will be spotted by ordinary humans. This aquatic human will then have to be so frightened of ordinary humans that they will stay out of sight when they spot any boats or ships. They would have to be able to survive drinking seawater all the time. And be able to sleep at sea without drowning. They could perhaps feed of shellfish and seaweed in shallow seas but today coastal waters are full of human beings so they will be spotted and perhaps photographed. To avoided land humans they might go far out into the oceans, but there they would have to swim fast enough to catch fish. Even if an aquatic human evolved to be able to survive on the open ocean. Nowadays there are large fishing ships that put out very large fishing nets that catch everything including dolphins. If this is the case, then surely these nets will also catch any aquatic humans swimming in the oceans. If it is very doubtful that a fully aquatic human exists today, could there have been a fully aquatic human in the past that became extinct? Now this is a real possibility considering that men have a history of committing genocide against any other race that looks slightly different from themselves. Any aquatic human that is not completely independent of land will be at a disadvantage if it meets any hostile ordinary human beings on a beach. So it might be that any branch of humans that became more aquatic than ordinary humans may have been wiped out by men simply because they looked strange and different. This could be the case of the duck feet people mentioned in Appendix One. As mentioned before it seems that on many Pacific islands there is archaeological evidence that there were people living there before the Polynesians arrived. On these remote islands where people lived mainly on seafood, humans could have become more aquatic than normal humans, but were then wiped out when ordinary humans like the Polynesians arrived on these islands. Certainly the Polynesians do have mermaid legends and this might be the origins of them. But this is all very much speculation; the only evidence of this is mermaid myths and that is all. Whereas the evidence that mermaids are simply women divers is far stronger. The only way something like this can be proven is if skeletons of ancient human are discovered with large flipper like feet. A fake documentary on this theory was made by Animal Planet called. It mentioned the Aquatic Ape Theory given it publicity which it needs. Recently they put out a follow up program called Mermaids: New Evidence. When I first done my blog I had a lot of Ama photographs but none of Haenyo divers but recently this has changed. So what I have done is collected them all together and put them in the Appendix. The haenyo, literally meaning "sea women", are female divers in the Korean province of Jeju. They are representative of the matriarchal family structure of Jeju. Until the 19th century, diving was mostly done by men. The job became unprofitable for men since they had to pay heavy taxes, unlike women who did not. Women took over the diving (which was considered the lowest of jobs) and, because of the great dependence on sea products in most places on Jeju, became the main breadwinners. It could also be said that women simply were more adapted for the job, with their bodies keeping them warmer and being more suited to swimming than a male - with more bodyfat and a lack of protruding external genitalia. With that, they often became "the head" of their family. They didn't limit their diving skills and activities to Jeju Island only. Since 1895, as they developed their diving skills into original jobs, they started to migrate to many foreign places on the Korean Peninsula and in Japan. As they have seasonally gone abroad or to the Korean peninsula to earn money at sea, they have contributed support to large portions of the island economy as a whole, by sending or bringing cash to their hometowns. Their migrations and settlements extended all over East Asia, to many areas on the Korean Peninsula, 10 places in Japan, 2 places in mainland China, and one place in Russia. In all these places, Jamnyeos have been recognized for their special skills in harvesting sea products of high economic value. As we can see haenyo divers have been an important conribution to Jeju Island community. This is why haenyo divers have survived on Jeju but were successfully banned on the mainland. It is very interesting that the status of women on Mara Island, where fisheries provide the sole occupation, is superior to men's both in the home and in the larger society. This status derives from the economic importance of their achievements at sea. -->Two heanyo divers at the time of the Japanese occupation, the faces of these two women shows us how hard life was for heanyo women in the past. Though this might also be to do with how badly the Jeju people suffered during the Japanese military occupation. Taken from web-site. Women divers head home at sunset after diving for abalone and other shellfish. 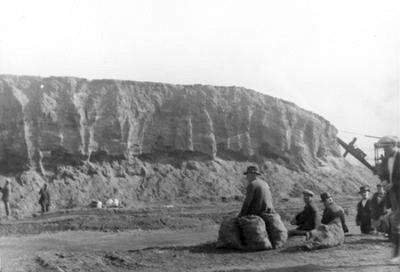 Provided by the Jeju Photography Club and the Jeju Haenyeo Museum. From web-site.